Australia and its surrounding islands and territories have more than 850 recorded species, of which more than 45% are found nowhere else on earth. Australian Birds features more than 100 of the country's most familiar birds, along with a map to the natural vegetation zones and a list of important bird viewing sites. 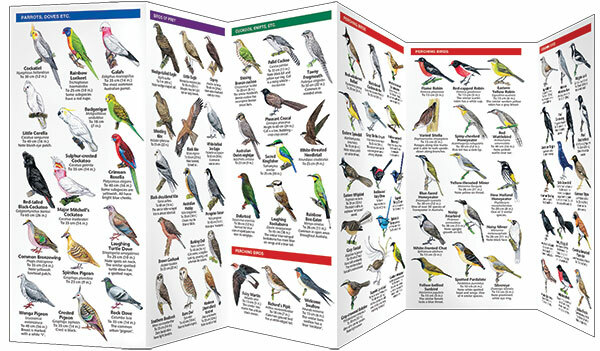 It is the ideal pocket-sized reference guide for bird lovers of all skill levels. Laminated for durability, this lightweight, pocket-sized folding guide is an excellent source of portable information and ideal for field use by visitors and residents alike. Made in the USA. Australia and its surrounding islands and territories have more than 850 recorded species, of which more than 45% are found nowhere else on earth. Australian Birds features more than 100 of the country’s most familiar birds, along with a map to the natural vegetation zones and a list of important bird viewing sites. 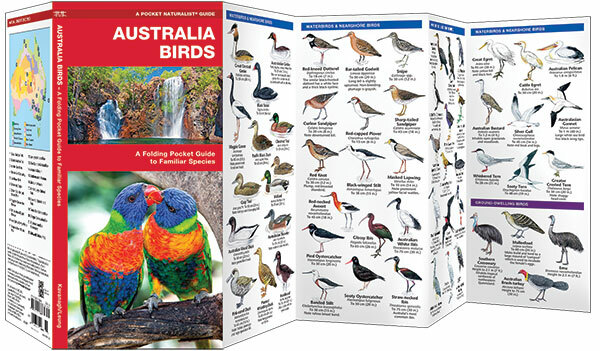 It is the ideal pocket-sized reference guide for bird lovers of all skill levels. Laminated for durability, this lightweight, pocket-sized folding guide is an excellent source of portable information and ideal for field use by visitors and residents alike. Made in the USA.